For riders looking to take the next step into clipless pedals, determining which shoes, which cleats, and which pedals work together is the first big hurdle. 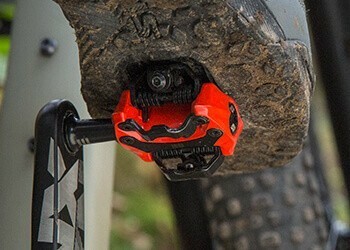 iSSi pedals use well-established cleat compatibilities: two-bolt Shimano SPD® style for our Flip, Flash and Trail models, and three-bolt Look Keo® for our Road pedals. But what’s the difference between SPD and Keo? What do two- and three-bolt mean? Besides being the year that David Lee Roth told us we might as well jump, 1984 also brought us the first commercially successful clipless pedal. Made by French ski binding maker Look, the cleat attached to the bottom of a cycling shoe via three bolts in a triangular pattern. Since then, many different manufacturers designed different pedal types that mount to a three-bolt shoe. But not all three-bolt cleats work with those pedals—more often than not, the cleats and pedals are designed together, so parts from different pedal makers don’t always play nice together. The iSSi Road pedal employs the same cleat design and attachment method as the modern Look Keo pedal — a direct descendant of the original. iSSi offers cleats with three float options to fit a wide range of pedaling styles or to help remedy repetitive stress injuries. Durable, affordable, and comfortable, it’s no surprise this cleat has been around as long as it has. In 1990, Shimano changed the way mountain bikers connect with their bikes forever. The SPD-M737 (Shimano Pedaling Dynamics) delivered clipless pedal technology in a much smaller, dual-sided package. The cleat was about a third of the size of clipless road pedal cleats and sat within a cutout in the sole of a mountain-specific shoe rather than right onto it. This allowed the wearer to get off and “hike-a-bike” when the terrain called for it. As with road shoes, the two-bolt pattern became the template for new pedal and cleat designs from other manufacturers, and likewise, these different cleats and pedals are not usually compatible with each other. The SPD-cleat is by far the most ubiquitous, so iSSi offers three SPD-compatible models (Flash, Flip, Trail). As with most things cycling related, your local bike shop will be the best resource for checking cleat/shoe/pedal compatibility, and getting you the right pedal for the style of riding you do.